Have you ever been just SICK of eating? 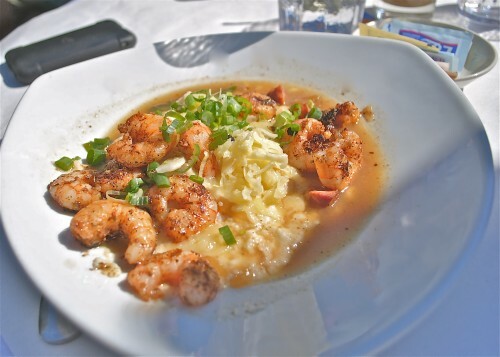 Have you ever been just sick of eating and you could not possibly take another bite of food and then you wake up the next day, still in New Orleans, and you know that you just can’t pass up that next wonderful meal in a city that your have been told has the most wonderful food in the world? Recently, I went on a mother/daughter trip to New Orleans with my daughter, my twin sister and her son. We had a fantastic time together as we always do and all this food and drink was such a temptation for 4 days. 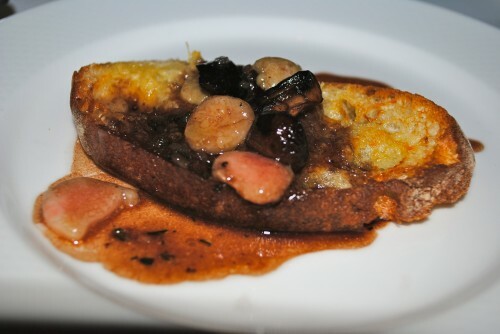 This appetizer was from Lilette and it was a White Truffle Parmigiano Toast with Wild Mushrooms, marrow and veal glaze. We ordered two orders and shared. Very rich and amazingly delicious. 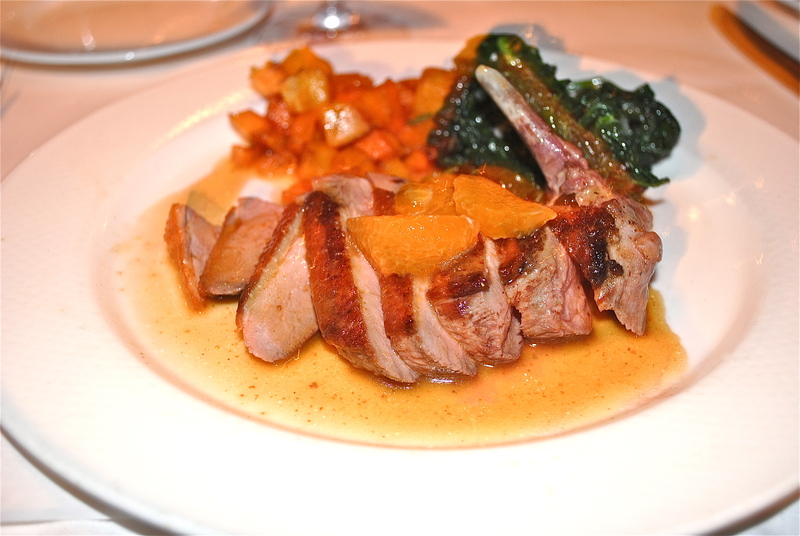 Roasted Muscovy duck breast with Tuscan kale, butternut squash, sage and satsuma coriander jus. 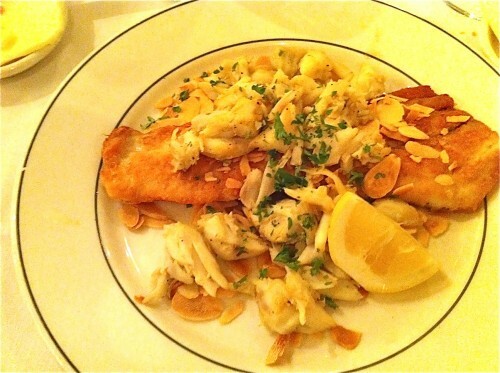 Now how could that not delight your taste buds. We planned this trip for months and had a huge list of “must eat at” restaurants from friends. We double booked some nights knowing that we were going to have to cancel one of those reservations because we could not possibly eat 6 meals a day. 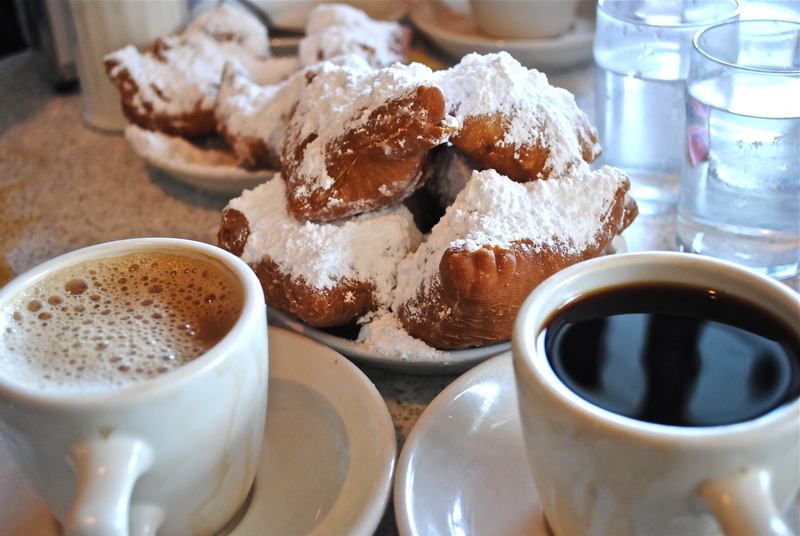 We managed to have beignets at Cafe Du Monde (my sister and her son had them twice), breakfast at Dante’s Kitchen, Lunch and then dinner twice at Acme Oyster House, Lilette for dinner one night. Mr. B’s Bistro’s was great and they also gave us menus to take home since we both collect menus and we begged and they gave in and let us have a couple. (After all it was our birthday.) 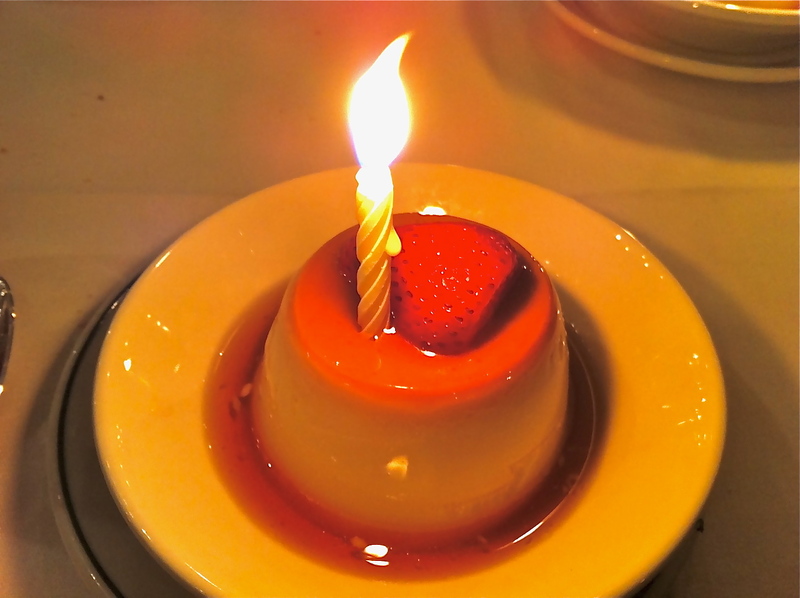 Our first night was at Galatoires and it was wonderful, another menu, a souvenir pen and birthday desserts. Beignets, coffee and hot chocolate from Cafe Du Monde. Who could resist this and it was more than worth waiting in line for a table. All of the free birthday desserts were great. 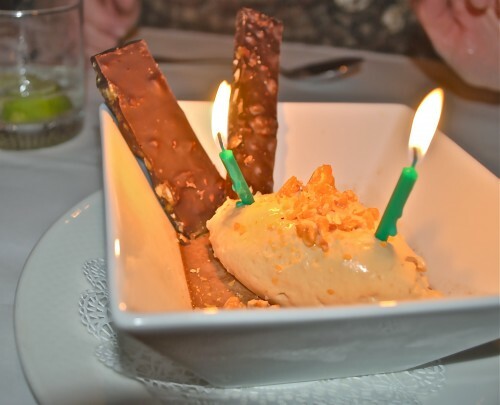 When I booked at Open Table, I put in the comment box that we were celebrating our birthday and low and behold a dessert appeared at the end of each meal with a candle and a bite or two of each dessert was just enough for all of us. Nutella custard with fleur de sel, caramel cream and chocolate-hazelnut brittle. Happy birthday to US! — This was from Lilette. 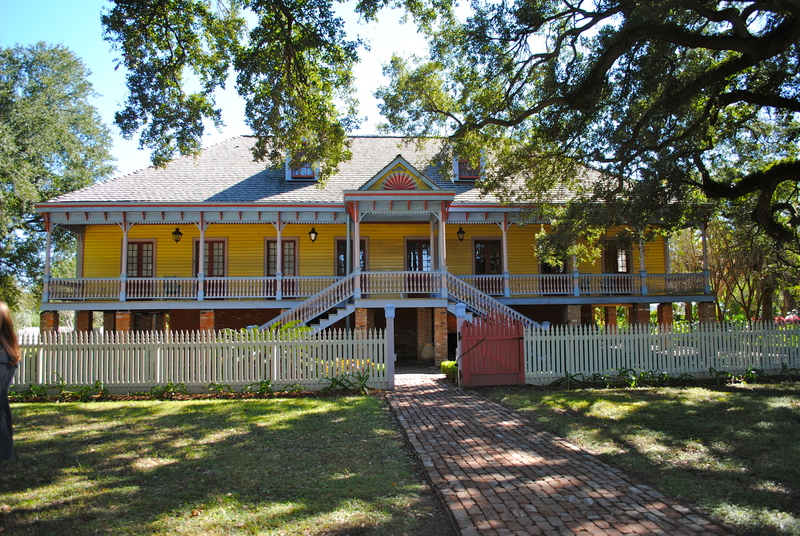 One day my daughter and I took a cooking class at New Orleans Cooking Experience. (I will be blogging those wonderful recipes.) 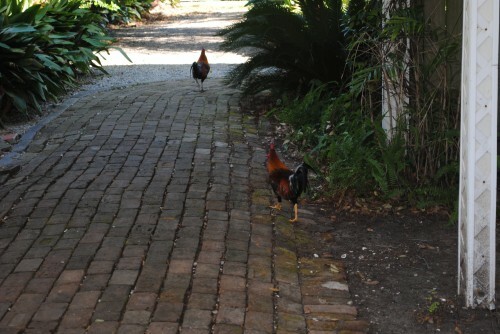 The lessons are held in a 1790 creole style house and there were visiting roosters strutting around the yard greeting all of us who attended the class. 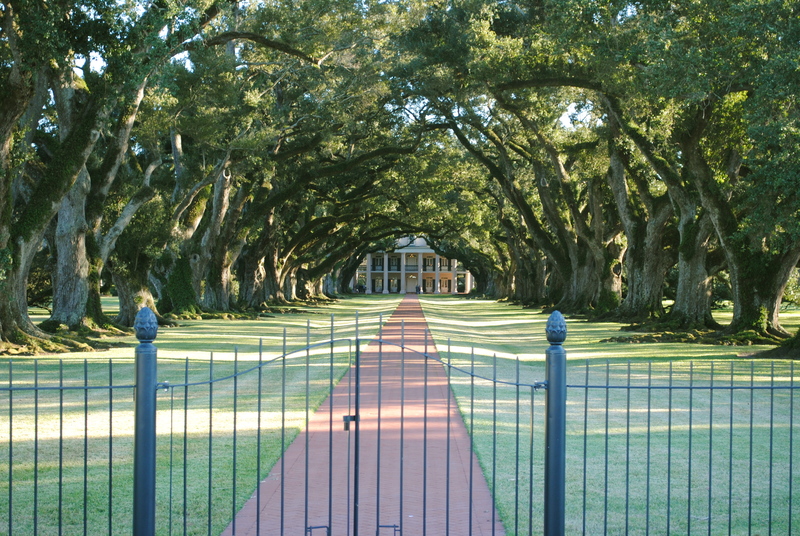 We toured Laura (above) and Oak Alley Plantations. Laura is a Creole Plantation and my favorite of the two we visited. Oak Alley had beautiful trees that are 300 years old. My sister and I decided we wanted to try absinthe. Not a very wise choice. 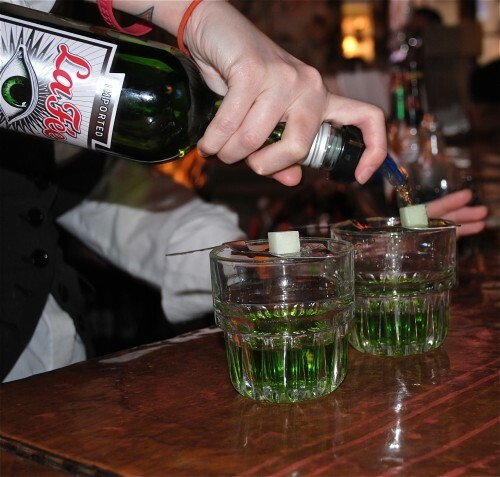 It was interesting watching them make it and all — putting a special slotted spoon over a glass, adding a sugar cube, pouring the absinthe over the cube, setting it on fire and then pouring water over the cube to finish the drink. All I can say is it was the nastiest thing I have ever put in my mouth and we did not hallucinate one bit. Brunch at Dante’s Kitchen on Sunday was fantastic. I had a milk punch and it was cool and refreshing as we sat outside to enjoy our meal. 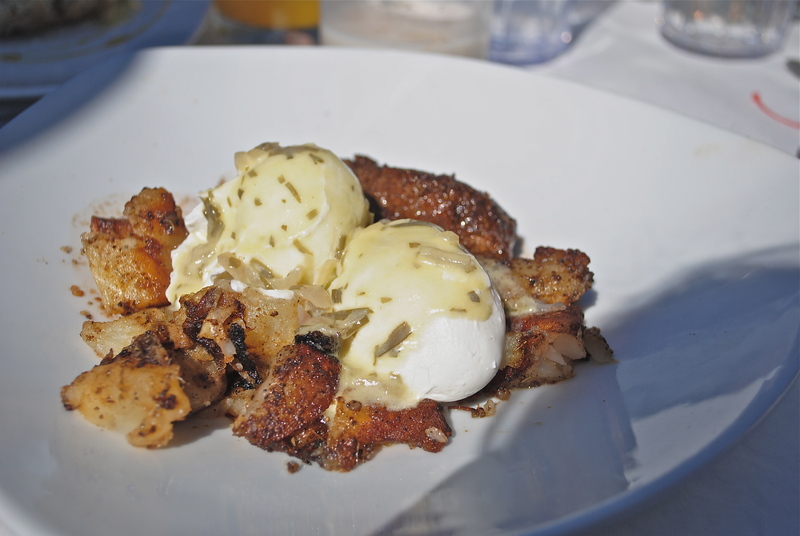 I had the steak and eggs (tenderloin, poached eggs, and Bearnaise sauce served over hash browns. 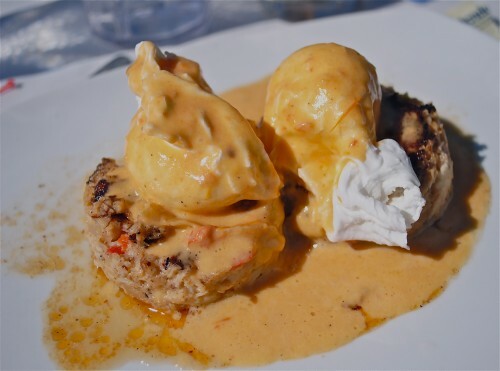 Seafood Cakes with lump crab meat served over a bourbon creamed corn sauce with marinated crab fingers. 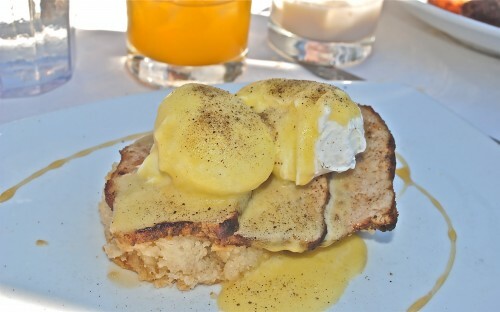 New twist on Eggs Benedict. Buttermilk biscuit with honey instead of English muffin and roasted rosemary rubbed pork loin slices instead of the ham and hollandaise sauce. My sister said her dish was great. My daughter’s Shrimp and Grits served with an andouille red eye gravy . 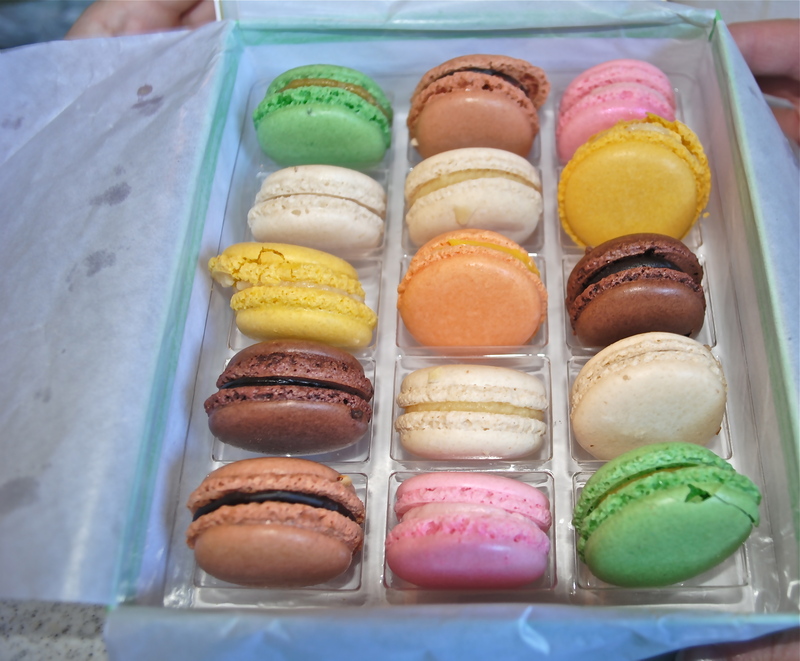 We stopped for some French macaroons at Sucre one day. I brought mine home and frozen them so I can compare them to macaroons I will be making at a cooking class. These were beautiful macaroons when they went into the freezer. We will see if they come out that way at Thanksgiving. 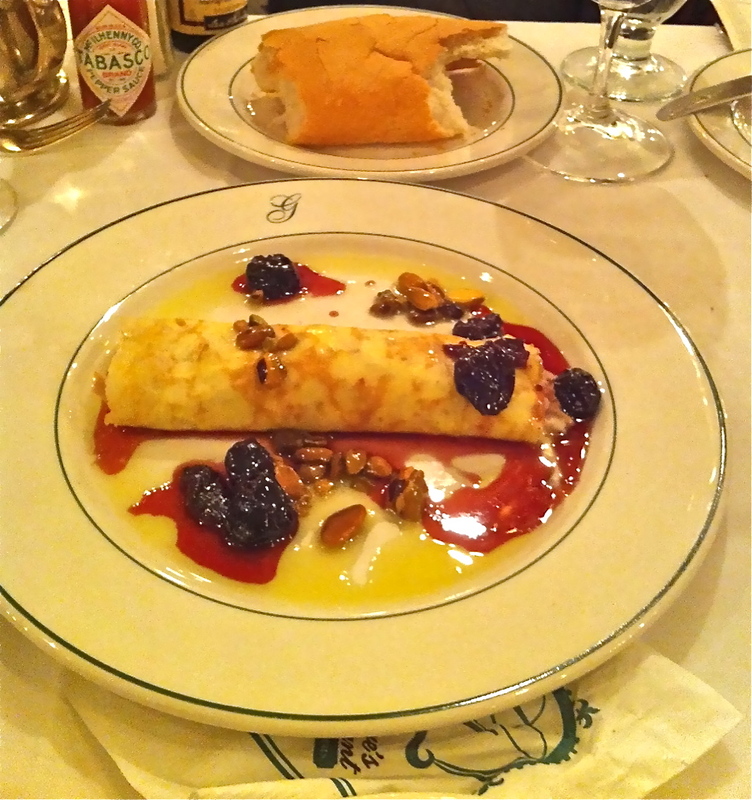 This was a wonderful duck crepe filled with boursin rosemary cheese with a port wine cherry sauce and pistachios. Galatoires did not disappoint us. Sorry for the bad picture. This one was from our first night and I used my cellphone. This dish was from Galatoires and was a black drum with brown butter almond sauce with lump crab, artichokes and mushrooms. Fantastic! Just one of our birthday desserts while there. Galatoires brought us two cream custards. What can I say but, DELICIOUS! Hope you have enjoyed some of our culinary adventures. And, sorry about the quality of the pictures. We took them in low lighting and sometimes used our cell phones.